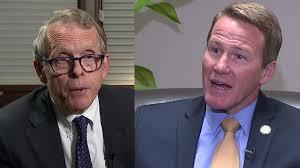 10th Period: DeWine-Husted Education Plan: We'll Fix our Failures. Trust Us. DeWine-Husted Education Plan: We'll Fix our Failures. Trust Us. Mike DeWine and Jon Husted have had a heavy hand in determining the Ohio's current state of public education policy. DeWine was on the conference committee that determined what the final version of the No Child Left Behind Act would look like in 2001. That law ended up creating the high-stakes testing structure we have in place and has received a lot of recent pushback from nearly everyone in the education community as incentivizing test taking over critical thinking. Likewise, in 2001, then state Rep. Jon Husted served as the Vice Chairman of the Primary and Secondary Education Subcommittee on the House Finance and Appropriations Committee -- the most important committee of any sort at that time. In 2003, he became chairman of that subcommittee -- a position I would hold 6 years later. When Husted was Vice Chair, the P&S subcommittee was the most important committee of any type in the legislature because it was the committee handling school funding. At the time, the Ohio Supreme Court had ruled twice that the way the state funded schools was unconstitutional because it didn't equitably or adequately provide a thorough and efficient education for our children. After Husted's attempts to fix the system during the 2001 biennial budget, the Court ruled not one, but two more times that the way Husted's system provided funding for students was unconstitutional. So it was kind of surprising to me to read DeWine and Husted's education plan, which was just released today as part of their gubernatorial campaign. In it, DeWine and Husted said they want to reduce testing and find an equitable funding system. Here's what it said about testing: "Standardized tests are limiting educator’s creativity and forcing them to a teach to a test." Here's what it said about Ohio's school funding system: They "will create a more equitable funding system that directs state resources toward supportive services for children most in need." So, the architects of the nation's high-stakes testing regime and Ohio's unconstitutional funding systems want to fix their previous failures. Not only that, but there is almost zero detail about how they plan on doing this. On the testing, the Ohio Department of Education and State Board of Education have presented a promising change in Ohio's report card system that would de-emphasize testing. Are DeWine and Husted saying they want to do that? Will they get rid of certain tests? Will they eliminate the test-dependent accountability system? On funding, it looks like they will be putting more money into support services for economically disadvantaged students. But will that be additional revenue? Or will it be taking money from somewhere else to fulfill that obligation? Will this be additional money for wraparound services? Or will it mean more teachers and smaller classes? Will it mean a dedicated element of the school funding formula dedicated to psychologists or other support staff? But I find it awfully interesting that one of the key architects of the law that created our high-stakes testing system now wants to de-emphasize tests (as opponents of NCLB have said for years). And the architect of our unconstitutional funding system now wants more equity in the funding system (using the same language I and others have used for years). I'm glad that these two men are now acknowledging that the last 17 years in which they have led Ohio and America down their education policy paths has essentially failed. But it sure seems like they're saying, "I know we tried this before and screwed it up, but trust us, we won't screw it up again." Interesting article. Huge decision about education policy. Best education will lead us in the way of prosperity. So, we can't show ignorance in the field of education. We should take huge part in budget to spend in education policy. This link www.capstonepaper.net i'm following now. Our best education policy will help us to fix the problem that we facing in education department. After following your advice, we will be able to create best educated society. This link http://www.personalstatementwriters.com/services/mba-personal-statement-writing/writing-a-letter-of-intent-for-mba-school/ i'm following. Here you've discussed about the failures of education system and we should fix the failure by following these rules. Here is the link www.professionalessaywriters.com We are having. I read the article its really big issue for every institution failure of the education systems. Thus, we need to solved this problem with good site changed in some education policies and strategies. Because good policy will help us to fix this problem.